Photo courtesy of Kathy Hayes. 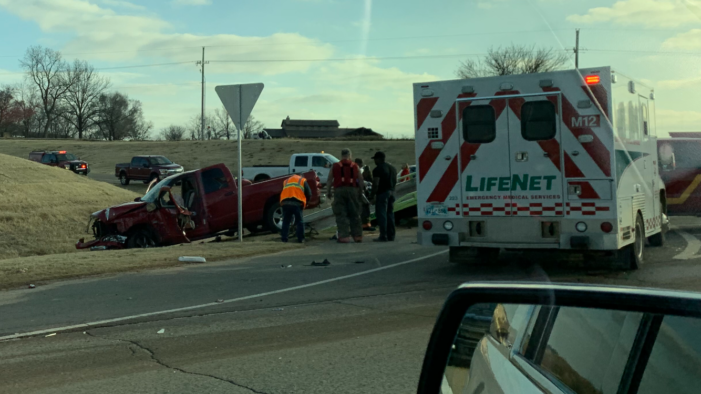 A Guthrie man was transported to a Oklahoma City hospital Tuesday afternoon after his vehicle was struck by a semi truck. Several agencies responded to State Highway 33 and Main Street in the city limits of Coyle for a two vehicle accident just after 3 p.m. The accident forced the roadway to be shut down for two hours and 20 minutes. According to the Oklahoma Highway Patrol, a 2008 Dodge Ram driven by Fred William Woods, 76, of Guthrie was stopped at a stop sign at the intersection, while the 2006 Kenworth was northbound on SH-33. The pickup truck proceeded from the stop sign and pulled out in front of the semi truck. The pickup truck departed the roadway. Woods was pinned in the vehicle for 20 minutes until being freed by the Coyle Fire Department. The report shows failure to yield at a stop sign as the cause of the accident. Woods was transported by Life Net to OU Medical Center and was admitted in good conditions with head, arm and external injuries. The 64-year-old driver of the semi truck was not injured.